Do you ever look in your fridge - which is full, by the way - only to realize there is nothing to eat? Maybe you grab something and notice it's expired, or you pick up a carton that's practically empty. The fridge is one spot in your home that everyone uses practically everyday. So keeping it organized is important to ensure that no food is wasted, and you don't go hungry looking for something edible in the disorganized mess! Here are some of my top tips for an organized fridge. Yes, that means EVERYTHING! Discard anything moldy, freezer-burnt, or expired. Go ahead and start a grocery list. Write down every item that will need to be replaced. Now that you have an empty fridge, it's the perfect time to wipe down those shelves and drawers. Remove any drawers or shelves and soak them in warm water mixed with mild dish soap. For stubborn stains (or smells), mix a small amount of baking soda with a little water to produce a thick paste. Apply the paste to the stain and leave for an hour before wiping with a damp sponge or cloth. The baking soda should loosen the stain, making it easy to wipe away. Use a mixture of warm water and dish soap to wipe down the interior. 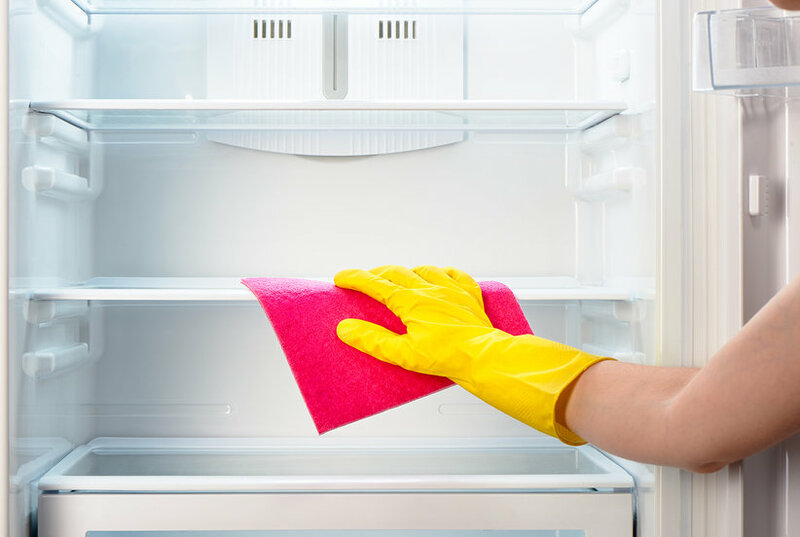 Be sure to not use ammonia or bleach-based cleaning products in your fridge, as it can be toxic if it comes in contact with the food you eat. When everything is clean, wipe down with a dry cloth. 3) Toss all cardboard packaging. Being able to see how much you have is the key to not over-buying. And speaking of being able to see what you already have...clear bins are CRUCIAL to easy storage and containment of like items. 4) Store frequently used items at eye level. Items you use the most should be easily accessible. By keeping them at eye level and towards the front you will minimize the amount of time you spend with the door open, and in turn, save energy and preserve your food. 5) Designate categories for each shelf/drawer. 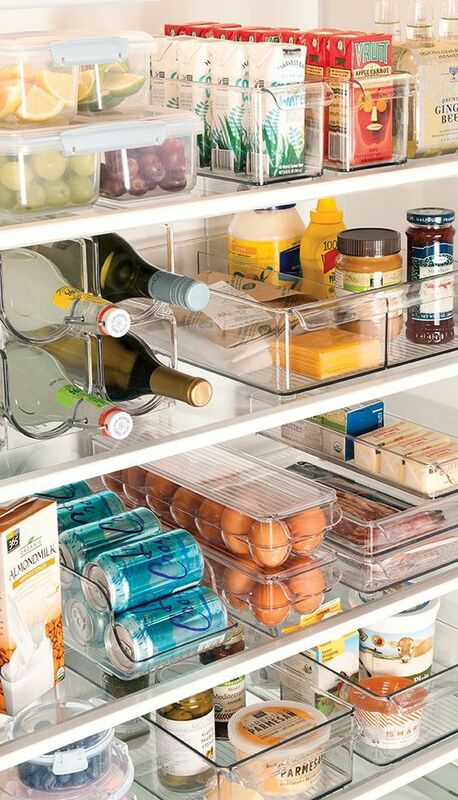 Sort the items in your fridge and label your bins, shelves, and drawers. I love to use oil-based paint pens or chalk pens since they can easily be erased and changed. Labeling really helps keep the entire family on track with your newly organized system. 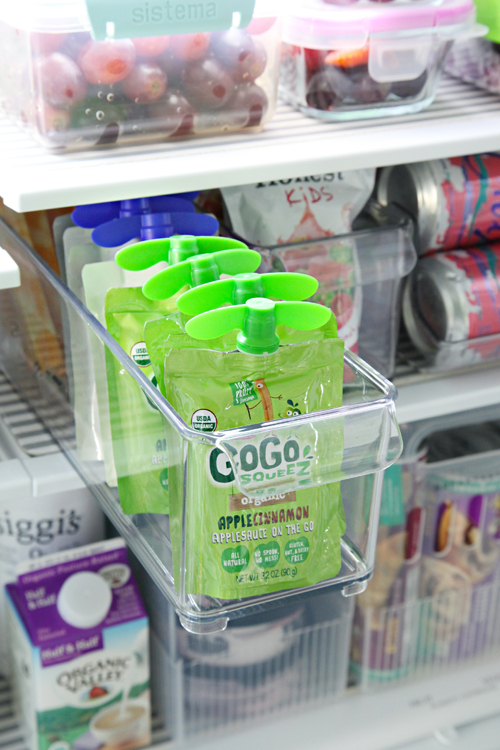 Now that your fridge is organized, let's keep it that way! Make it a weekly habit to discard expired items and to take inventory of what you already have BEFORE you go to the store. 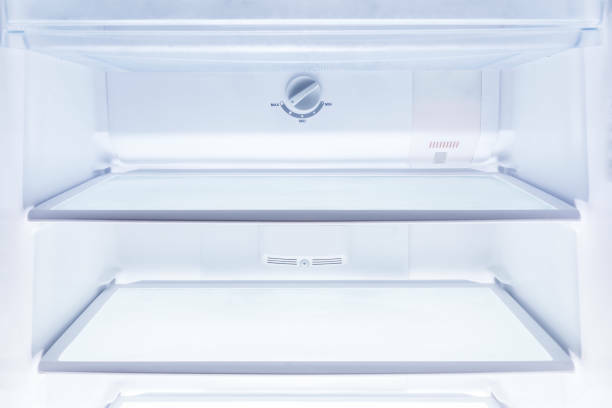 Be sure to do a full clean-out monthly to keep your fridge fresh. 1. Air needs to circulate around food to keep it cool. A cluttered fridge creates warm spots and can spoil food. 2. Check the humidity settings on your fridge drawers. Veggies should be at a high humidity and fruits should be lower. 3. Place milk or quick-to-perish items on lower shelves where the temperature is coolest. Don't store these items in the door where temperatures can fluctuate when the door opens. 4. Store raw meat on the lowest shelf to prevent dripping and contamination of other foods.